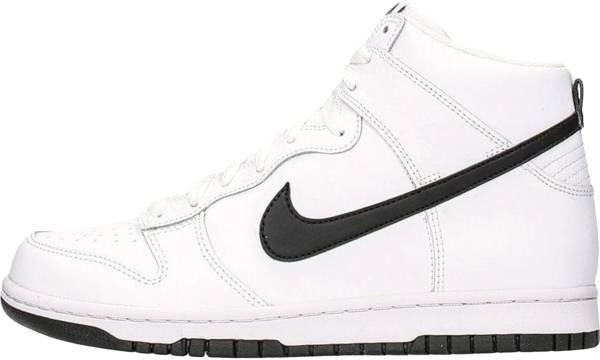 Many of the reviewers were captured by the Nike Dunk High’s classic look and loving the overall projection of the silhouette. With a well-thought placing of premium materials and design, the shoe screams superb quality from the sole up to the high top shank and a good number of wearers commended the package. The Dunk High provided supreme comfort and cushioning to several users' feet whether they're out playing basketball or just sporting the shoe in casual everyday routines. According to a dozen wearers, the shoe's outline coincides with any outfit they put on ranging from either casual jeans and shirts or a more formal suit and tie or even dresses and skirts for women. A fair number of buyers experienced a true to size fit catered by the shoe and a percentage of them even proclaimed that the shoes fit them perfectly. More than a handful of users stated that either the shoe is even better than what they expected or is what they expected when it was delivered. Few customers explicitly detailed their appreciation for the colorway that they ordered. Half a dozen users asserted that the shoe is awesome. Because of the brilliance of the shoe, more than a handful of reviewers highly recommend the shoe and some of them even started buying their closer relatives a pair. Based on shoe function and quality, several customers appreciated the Nike Dunk High's great value for money. A small number of users praised the shoe's durability as well as supporting feature and a purchaser even stated that the shoe helped aid him with arch support. Superlatively designed with contours and materials placed in the right position, the Nike Dunk High attracted a lot of buyers with its eye-catching silhouette and stylish glow and a dozen of them even applauded several colorways. Some of the colorways and released models of the Nike Dunk High ran narrow and is a tad smaller than the usual sizes of a few customers. A couple of users were disappointed with the actual shoe as the colors and appearance were not what they expected compared to the pictures. A user complained about the shoe not being breathable. The Nike Dunk High is a classic hoop shoe model which never fails to address style in all forms of clothing combinations due to its basic flat sole image combined with exemplary contouring of different components and hues. The shoe's comfort and cushioning gratifies a vast variety of activities whether in court or in conventional daily walks and casual events. Truly a shoe for a recommendation, the Nike Dunk High exemplifies vintage roots while acknowledging grandeur into contemporary living. The first ever public dunk ever to set foot in history was probably that of Jack Inglis, a player in the guard position from the state of New York. According to the author Bill Gutman, during the dawn of the basketball zeitgeist, fences were stationed around the perimeter of a basketball court to safeguard audiences from the players mainly because the out-of-bounds rule was optional at the era. Inglis utilized the fence and grabbed the ball thrown to him by his co-player and performed the earliest of the so-called dunk. The universal meaning of the dunk during the initial stage of the century was to lower a pastry into a beverage, and coining the action performed by Inglis came decades after with the introduction of the dunk into official games by Joe Fortenberry. Numerous players including Olympic medallist Bob Kurland had since then have been using the dunk to score high percentage points. Dunking became a staple in the sport gradually progressing to extreme high-flying antics which resulted in a creation of a specific event for it-- the Dunk Contest. Icons like Dominique Wilkins and Spud Webb participated in the 80s dunk tournaments but a particular player stood out to win two consecutive titles and his name was Michael Jordan. Michael's abilities as a rookie attracted Nike and the shoe designer Peter Moore which considered drafting the player as the promoter of a Nike model called the Nike Airship but was remodeled and re-released to become the Air Jordan I. Similarly, the Nike Legend brand that was intentionally made for more heavyweight players was released a couple of years before the Jordan I and was the experimentation core for different sneaker technologies like visible perforations in the toe box and colored soles. The production of different patterns for basketball shoes was triggered in the 80s and various forms were released by Nike combining different features from earlier shoe lines and an initial example of this was the Nike Dunk series. The Nike Dunk line, again a brainchild of Moore, was originally created for college athletes sporting basketball shoes with their university color theme thus establishing the Nike College Color program. It was made available in low and high tops granting two choices for different colleges. The other half was the Nike Dunk High and has the designated breathability system on the toe box area of the Nike Legend as well as the colored outsole. Besides its coloring, the design from the outsole was inspired by the Jordan I's along with its upper colorway mixture. Before the Dunk name was conceived, Peter Moore theoretically named the shoe ''Nike College Color High'' but the Legend model influenced the name as we now know. From coffee-dipping donuts to high percentage shots, the Nike Dunk High instilled an addendum to its meaning by morphing different enhancing technologies from previous shoe designs to soar into the sneaker world with class. Upgrading comfort, cushioning, stability, and a lighter weight from the original shoe release, the Nike Dunk High's apparent function correlates with the shoe's vintage outlook that numerous recipients love to acquire. Pairing the sneakers with jeans is most common but sporting them along with suits and tuxedos for formal events flatters as well. With a vast number of colorways ranging from subtle to extreme, the silhouette never forgets the foundation of the first models introduced. Maintaining the fit of the original release, the Nike Dunk High runs true to size with a broad sizing ranging from 6-15 in men's D medium width. It is also available in women's from 5-11 sizes. The shoe exhibits a flat outsole with a pattern almost similar to the Air Jordan I with slight details that are different which is also tinted in different colors depending on the colorway. Its high top character replicates that of the early Nike basketball shoes with layouts emboldened by the likes of Nike Air Force I, Jordan I and the Nike Legend. A key difference in the upper of the Nike Dunk High versus that of the Nike SB Dunk High and Air Jordan I is that the lace patch on the vamp of the Dunk High is sewn on top of an overlay located on the front of these shoes. Its fame in the 80s enabled the shoe to continue a legacy for decades while gradually creating numerous assortments of colorways and different materials from canvas to suede uppers that symbolized multifarious events and causes. The shoe brand is part of the Nike customize your shoe project which is named the Nike Dunk Hi ID that is made available for men and women. Several celebrities and athletes spotted fashioning the shoe are Jeremy Lin, Ronnie Ortiz, Jake Gyllenhaal, Forest Whitaker, Kanye West and much more. Originally formed to address top college basketball teams in 1985 with the "Be True to Your School" program which involves colorways paralleling that of the university colors making it the team's official shoe. A retro of the Nike Dunk High was released in 1998 with a subsequent follow through in 2003 featuring the original "Be True to Your School" color schemes.